Chapter 1: It was destiny…. I bought a later model 3.5E at a Kiwanis/Masons rummage sale in August. I figured that it would be a bunch of old guys, and thought they might be selling some old cameras. There were a hundred or so of those super-cheapie plastic cameras marked 50 cents each (I wouldn’t take them for free, and I’m a camera junkie, so you know they were crap). The photo pickin’s were scare. I had almost given up when I spotted the Rollei TLR from across the room. Some guy had it and was checking it out. I hurried over, trying not to look like I was hurrying. It was all I could do not to grab it out of his hands. I pretended I was looking at something else on the table while the guy and the seller talked. There was a big sign on the table that said “Rolleiflex and accessories $150”. 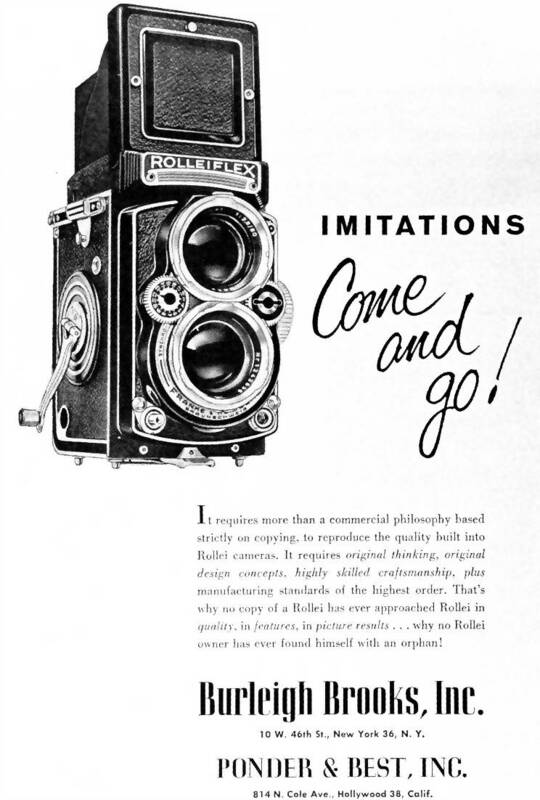 I’d heard the name Rollei before, and I knew they made quality, collectable cameras, but I’d never handled one before, or really even knew much about them. After several agonizing minutes, the guy finally set it down. A quick side step and it was in my hands. It was very clean. It felt heavy and solid like only an all metal camera feels. You could sense the quality just by holding it. I just felt that it had to be worth more than he was asking. I talked to the seller for a while. He loved it, but hadn’t used it in years. He’d gone digital. He proudly showed me how it worked. I was in love, but I didn’t let on. I scurried off to the bank. I didn’t even know if we had $150. How was I going to explain this to my wife? The guy was surprised when I returned, and whipped out the cash. He seemed sad to see it go. It was almost like he set it out for a conversation piece, never thinking it would actually sell. I took it home and ran a roll of film through it. It was obvious from the first roll that this was an extraordinary camera. I’ve shot about 30 rolls of Tmax 100 and HP5 400 with it to date. I am amazed at the quality of the images. It’s as good as the top modern MF gear. I researched on the web, and found out it was made in 1957. I looked EBAY and found that similar models went for about $300-$400. I’d gotten a great deal! I almost felt bad…almost. It takes 12 6cm x 6cm images on 120 film. Film loading is a breeze. It senses the film thickness and activates the frame counter. That’s more high tech than my Pentax 67II. Film is advanced by turning a handle on the right side. It only takes about a quarter of a turn or so to advance to the next frame. Then the shutter is cocked by turning the handle backwards. You can keep turning it backwards until it folds into the body if you want. There is a switch at the base of the handle to allow the shutter to be cocked without advancing the film for multiple exposures. The shooting lens is a 75mm f/3.5 Zeiss Planar; it’s immaculate. It doesn’t have interchangable lenses. Rollei 3.5 models come with one of the following 75mm f/3.5 lenses: Zeiss Tessar or Planar, Schneider Xenar or Xenotar. The Tessar and Xenar models are the cheaper lenses. The Planar and Xenotar are considered better, although all of them probably perform equally well around f/11. The Rollei 2.8 models come with an 80mm f/2.8 Planar or Xenotar, and they are the most expensive of the bunch. There is much debate over which is better the f/3.5 Planars and Xenotars, or the f/2.8 models. A lot of people say the 3.5s do better at f/3.5 than the 2.8s do at f/3.5. The Zeiss lenses seem to be more popular (more expensive), but the Schneiders get rave reviews. 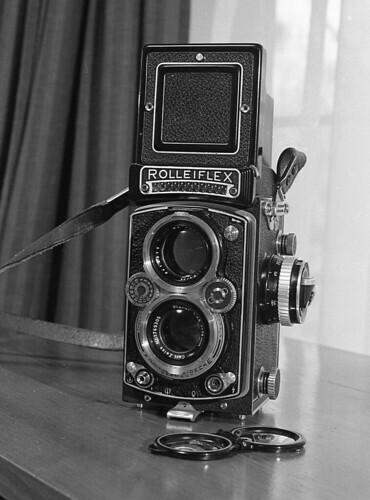 The aperture and shutter controls are two dials on the front of the camera. The aperture and shutter display are just in front of the viewing hood. The dials can be coupled together if you prefer to work using Exposure Index (that might not be the right term). Personally, like most folks these days I imagine, I work in split seconds and f/stops, so I keep it uncoupled. The shutter speeds are 500, 250, 125, 60, 30, 15, 8, 4, 2, 1, and bulb. It has apertures f/3.5 through f/22. It has a built in light meter which I’ve never even checked or used; I use my Sekonic 508 meter for almost all my cameras, as many don’t have built in meters. The needle on the camera wiggles as the light changes. It’s an old fashioned meter; it doesn’t need batteries. There are two settings; one for regular daylight and the other for inside or dim. It’s set up so it also displays the correct EI number. When I get another Rollei I’ll probably look for one without a meter to save weight. The viewing hood pops up so you can look down onto the ground glass. Mine has a grid pattern on it. Even with the f/2.8 viewing lens (all models have an f/2.8 viewing lens) it can be very dim in low light. There is a focusing assist (which sort of works, sort of doesn’t), and you can fold the hood into a sport finder. My ground glass and mirror had a lot of dust on them; I removed four small screws and was able to clean them off. It’s an improvement, but I still think that someday I’ll send it in for a CLA and get a Maxwell screen put in. They are supposed to be much brighter, and you can get them with a split screen focus assist in the center. The shutter release is on the lower right side (if you are holding the camera). There is a cable release socket, and a switch to lock the button, although a cable can still trigger the shutter, even when locked (at least with mine). Opposite the shutter button is a flash switch. It has a flash bulb and electronic flash setting. I’ve been using mine with modern flashes and it works great. There is a self timer, but I have had so much trouble with built in timers on vintage cameras that I just leave it alone. The timer springs always seem horribly worn out, and I get scared that it’s going to lock up the shutter. this hasn’t ever happened with this camera, but the self-timer doesn’t sound too good. I have a screw in timer if I need it. The focusing knob is on the left side. It’s laid out in feet. There is a nifty DOF scale next to the distance ring. Mine only works part of the time; definately need that CLA. There are lots of accessories available from Rollei and other brands. Because of the collectability of Rollei gear, you will pay more for something that says Rollei, than an off brand. I paid $20 for a Kalcor lens hood; it would have probably been $60 for the Rollei hood. But sometimes you can get good deals. Rolleis with Tessar or Xenar lenses use size bayonet I for lens accessories. 3.5 Planars and Xenotars use bayonet II, and 2.8 Planar and Xenotars use bayonet III. The Rollinar close up lens sets are amazing. There are three sets that allow you to focus closer than the normal close focus distance of about 3.5′. I have a #1 set, and a #3. They mount right on the front of the lenses. The image quality is stunning. The #1 is perfect for head and shoulder portraits. The #3 will focus as close as 14″, almost filling the neg with my hand. There are only two problems with this camera. The difficulty of focusing in low light (I’m hoping the Maxwell screen will solve this), and I don’t like how the case fits. You have to remove the leather case to reload. The case fits around the straps in a funny way. This requires you to have an authentic Rollei strap with the quick releases. Because these seem to go for about $60 on EBAY, I have a Pentax strap, semi-permanently attached via a trip to the hardware store. If I want to use the leather case I bought, I’ll have to fork over the bucks for a Rollei strap. But I can live with it. Hi, really nice post on a really cool camera, in fact the shot you used is one I took of mine on Flickr. While I don’t mind other people using my photo for say non monetary purposes (like blog posts about TLRs), I do like advance notice and a proper credit in the photo cut line.